Aska leader, vocalist, and guitarist George Call has been busy the last few years. 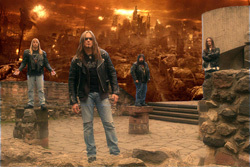 He helped toresurrect traditional US metal band Banshee as the vocalist for 2012's Mindslave. Call has also aided fellow Pure Steel stablemate Warrion to kickstart their first album. Now he returns with his mates of Aska for their sixth album, Fire Eater. Once more Call and Aska stray little from their traditional heavy/power metal roots. The very fact that they cover Judas Priest's The Ripper shows exactly where this band stands: true metal on the American side of things. But they're not afraid to mix things up. By example, Harlot of Eden reminds more of edgier melodic hard rock than metal. Then there's the ballad Angela which moves by light guitar and Call showing more restraint in his vocal performance. Later, this motif returns with the anthem Year of Jubilee, which has this highly orchestrated symphonic foundation, again, with Call milder in his approach. These seem a large contrast to other songs, because there is definitely traditional metal here. Everyone Dies, Valhalla, the racing Eye of the Serpent, and the catchy Dead Again are definitely 'true' metal. As for The Ripper? It's alright, but on his best day Call can't rival Halford. Can anybody? Otherwise, Aska's Fire Eater is strong and entertaining traditional American heavy metal, with a few surpises thrown in. Recommended. 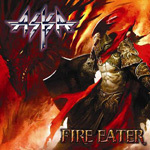 Aska's Fire Eater is strong and entertaining traditional American heavy metal, with a few surpises thrown in.